Many people today work from home. When doing so, it is vital to have a space that is specifically work orientated so that the person has somewhere in which to concentrate solely on their job. When creating a home office space, many people initially think that it must be purely functional and practical. However, with the choices of decor available today, it is entirely possible to have both a stylish and sensible home office space. 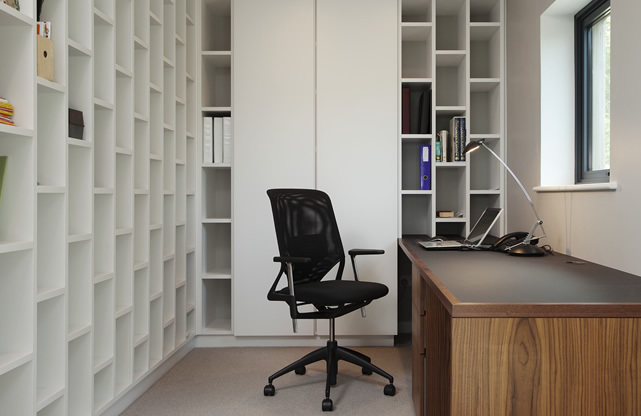 Some of the basic pieces often needed for a home office include storage units, desks, filing cabinets and book cases. One of the problems of working from home can often be a distinct lack of organisation, so it is vital to have the right pieces of furniture in the room to ensure that you stay on top of work. Without the right amount of storage units and cabinets, it is all too easy to misplace or lose important documents and other paperwork. The same organisational principles apply in a home office as do in a professional office, although of course with a home office, you have the opportunity to customise the room to your preferences. Having bespoke furniture made is an excellent way to ensure that the space is fully suited to your needs. Creating a desk that fits nicely into the room and has plenty of built in storage will ensure that a small home office looks spacious and is easy to keep organised. Similarly, bespoke furniture pieces such as shelving units can be made with your storage needs in mind, so that each unit fits your books, files and paperwork inside perfectly. Saving space is usually one of the main priorities for those installing a home office. The furniture in this room should be multifunctional where possible and this is where bespoke office furniture shines in terms of its practicality. Many people want to use their office space as somewhere to relax when the work day is done; if this is the case, then a foldaway desk can be incredibly practical, as it will save room when it is not in use and will still offer plenty of work space when it is needed. In terms of seating, it is not always necessary to purchase an unattractive office chair. Having a bespoke furniture specialist make a chair will ensure that it supports the back when you are working, but also looks chic and stylish when you want to use the room for a relaxing night in after the day is over. Lighting is, of course, a very important factor; it needs to flatter the space, but also be practical and provide the right amount of light for working over a long period of time. When choosing a location in the home for the office, it is essential to consider the light sources available. For working during the day, natural light is best, so try to choose a room with a large window if possible, as this will put less strain on the eyes when sitting at the computer for hours at a time.